Avrex Travel - Travel Itineraries for You! Where is Killbear Provincial Park? Killbear Provincial Park, located on beautiful Georgian Bay, is just 3 hours north of Toronto, Ontario, Canada. 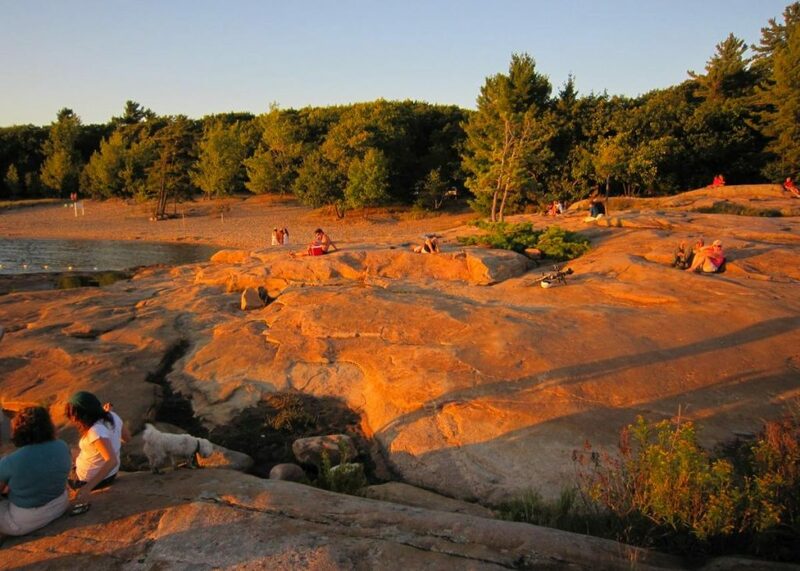 Killbear is one of the most popular (busiest) provincial parks in Ontario given its close proximity to heavily populated Southern Ontario and the many activities available to visitors. Killbear has a great range of summer activities for everyone. 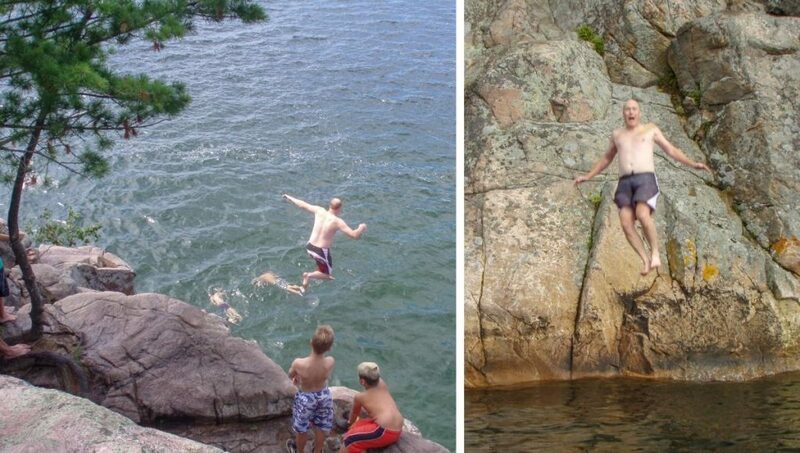 One of the most unique and exhilarating activities at Killbear, is the chance to cliff jump. The cliff jumping occurs at Harold Point Rocks. Please note that this activity is not encouraged by park staff. You are jumping at your own risk. On a hot summer day it is especially enjoyable but do take care and practice common sense. At its highest point, the jump is over 30 feet. It requires that you step out far enough to clear the ledge below. Trust me, its not as scary as it sounds. Even the little ones can participate by jumping from the rock ledges below the clifftop. Beaches are within easy walking distance of all campgrounds at Killbear. The 2 kilometer long horseshoe shaped beach at Kilcoursie Bay is by far the top choice, affording plenty of room to stretch out and sun. The swimming is great, with a large shallow area making it easy to keep an eye on the kids. The other beaches are at Georgian, Harold Point, Granite Saddle, Lighthouse Point and Blind Bay Campgrounds. While these beaches are smaller with rocky terrain, they are still perfect places to relax and unwind. The waterways at Killbear are perfect for paddling. For this trip, I brought my own kayak. There are no rentals onsite, but rentals are available from outfitters outside the park. I spent an entire day kayaking along the adjoining Parry Sound strait. There were lots of opportunities to pull my kayak over and explore the nearby islands (Davy, Scott, and Cousin Islands). The paddling near the shore is easy and the views exceptional on this calm body of water. I went as far as Lighthouse Point before turning around after an exhilarating day. The Recreational Trail is a 6 kilometer dirt trail that can be used by cyclists and walkers. The trail covers the length of the park, running alongside the main park road making it safe for the kids as you don’t have to worry about dealing with vehicle traffic on the road. 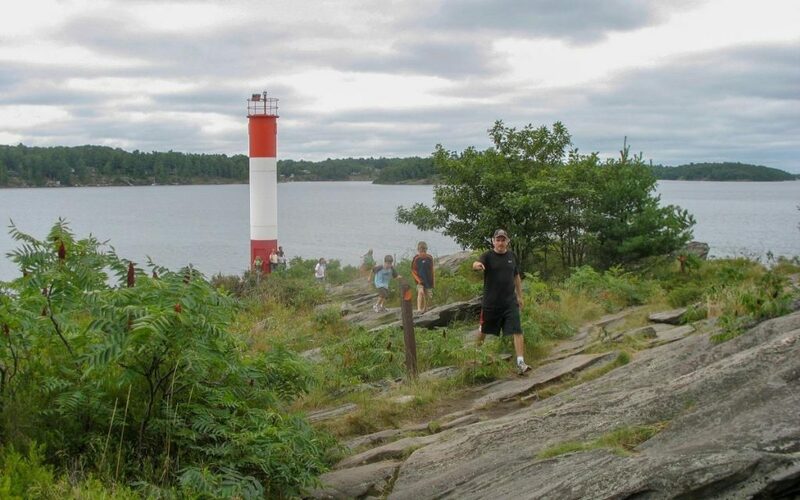 There are several hiking trails to choose from at Killbear. On this day, we chose the Lighthouse Point Trail. The trailhead begins at the end of the Recreational Trail. There is vehicle parking available here. We opted to lock our bicycles in the parking lot. The trail is an easy 800 meter loop through the woods to Killbear Point where you can see Killbear Beacon (i.e. the lighthouse). We also spent time checking out the rocky beach and skimming stones into the water. There are two other hiking trails to check out. Twin Points Trail is a 1.6 kilometer loop through the forest. Lookout Point Trail is the longest trail at 3.5 kilometer loop. It takes you up the escarpment to a beautiful viewpoint of Georgian Bay. Bring your fishing gear! On the peninsula of Lighthouse Point Trail, we pulled out our fishing rods for the chance to catch some Lake Trout. After a busy day of activities, pick a spot along the rocks of the escarpment and enjoy the view. The sunsets on Georgian Bay can be spectacular. Pick a spot along the rocks of the escarpment of Killbear Provincial Park and enjoy the beautiful sunsets. 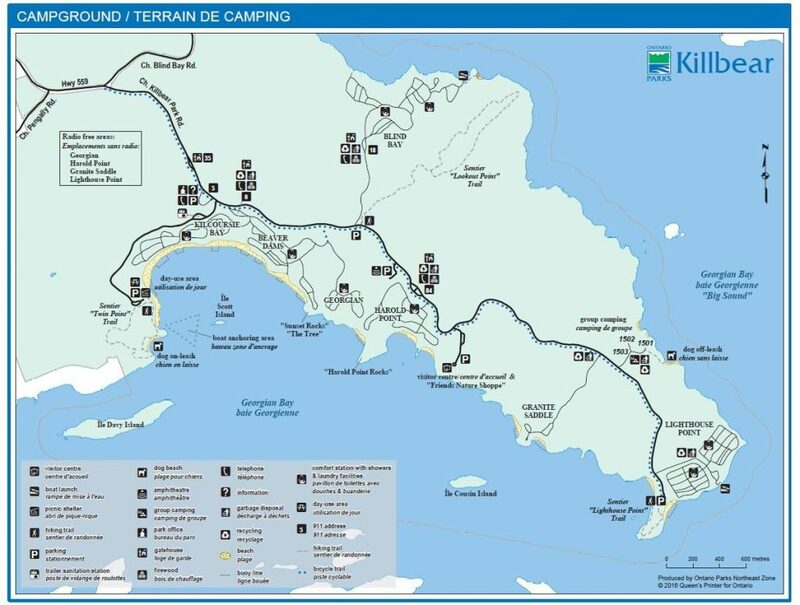 Killbear is a large campground with 886 campsites. 252 of them are electrical sites. There are also 33 pull-through RV sites. The Electrical sites are available in Kilcoursie, Beaver Dams and Harold Point Campgrounds. The following campgrounds are non-electric: Greorgian, Granite Saddle, Lighthouse Point and Blind Bay. For peace and quiet, there are also 457 radio free campsites. What are the Best Campsites at Killbear Provincial Park? 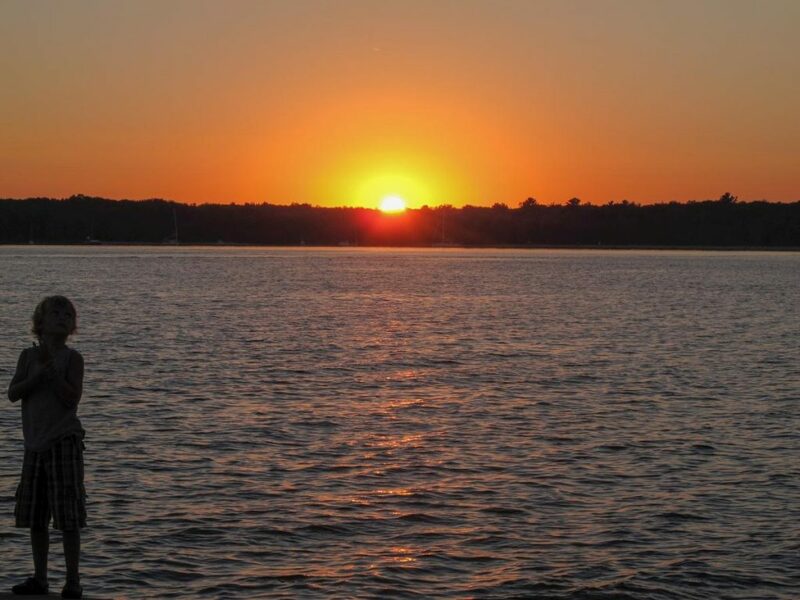 In my opinion, the best campsites at Killbear are located at the Kilcoursie Bay Campground. With a large selection of electrical sites and easy access to the main beach, it’s a great place to book a site. There is no store at Killbear. Remember to pick up food and ice in Parry Sound before you arrive. The Visitor Centre has great interactive exhibits about the park and wildlife. Here you can learn about the protected Massasauga Rattlesnake. Is there Wifi at Killbear Provincial Park? Yes, if you need to be connected, there is wifi service available at the visitor centre. There are 8 Comfort Stations with Laundromat. Are there bears at Killbear? Yes. Black Bears have a natural range that can take them through the Killbear region. For the safety of humans, and more importantly the bear population, it is important that campers bear proof their campsites by not leaving any food out. You can be fined by park staff if you don’t remove food from your picnic table and bear-proof your site. Why is the park called KillBear? According to the website Friends Of Killbear, the First Nations called this point, Mukwa Nayoshing i.e. ‘Bear Point’. But then why is it called “Kill” Bear? Nobody knows for sure. However, the best guess is there was an initial mis-translation of the word and the name Killbear ultimately stuck. Killbear is one of Ontario’s best Provincial Parks for summer camping. With all the activities available to you at Killbear, what are you waiting for? Get out there and enjoy! The sunsets on Georgian Bay at Killbear Provincial Park are spectacular. @2019 - AvrexTravel.com. All Rights Reserved.